The highest vault in California in 1900 was by Ukiah’s Arthur Henley who scaled 10-7½. The Redwood Empire has produced a number of great vaulters since then. In 1918 another Wildcat, sophomore Eric Richardson, won the state championship at 11-6. Richardson’s 12-2 best in 1920 held as the Empire record for 17 years. 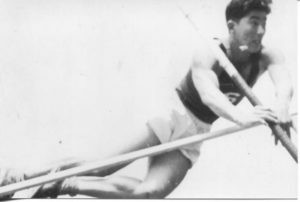 Analy’s Kaname Ono placed second at state two years in a row (1936 and 1937). Ono’s 12-9 best held as the Empire record for 14 years until another Tiger, Bob Foster, tied the height and second place finish at state. 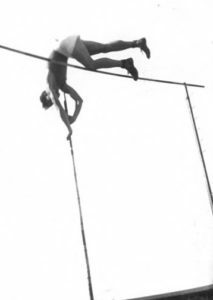 As the vaulting poles progressed from bamboo to medal to fiberglass the Empire record kept going up until Montgomery’s Steve Lawry had it to 13-9½ in 1974. Then two years later (1976) came the big jump as St. Helena’s Tim McDonald added over a foot to the record with a 14-9¾ vault to win the NCS MOC meet. McDonald would place 7th at state that year and his record held for 8 years and still makes the all-time top 50 performances. McDonald would go on after high school to set records at the SRJC and finally clear 18-3 at Cal Poly San Luis Obispo. In 1983 and 1984 Santa Rosa’s John Gash, also one of our best hurdler’s ever, literally took the record to new heights. Gash medaled at state both years and had the five highest vaults ever with three jumps higher than 15 feet with his best coming in the NorCal Finals, a former meet between NCS MOC and State, clearing 15-6. 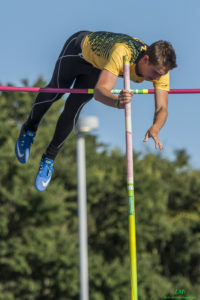 He later competed for Stanford and cleared 17-8¾. 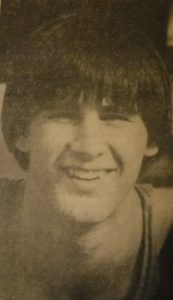 That 15-6 mark would hold for 11 years until Petaluma’s Rene Loraine would raise the record three times, 15-6½, 15-7½ and finally 15-9 to win the NCS Redwood Section meet in 1995. 23 years later it is still the Empire record. Loraine had a 15-0 vault as a junior in 1994 to win the NCS MOC before placing 8th that year at State. He finished high school with 14 vaults at 14-8 or higher all in the top 20 at the time and still all in the top 54. Maria Carrillo’s Jake Arnold added three jumps to the current performance list in 2002 with a best of 15-0 but that year had sophomore twins emerging that would do the biggest re-write of the performance list in a long time. Arnold would go on to be one of the country’s best decathletes and was only the second athlete in NCAA Division I history to win consecutive titles in the decathlon. He had a best of 17-4½ in the vault. Montgomery’s Matt and Mike Tillinghast would battle back and forth for the following two years stealing the Viking record away from each other. 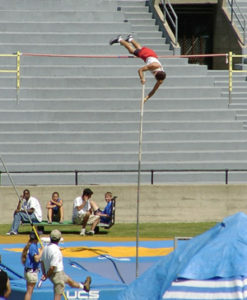 In 2003 Matt was the first to reach 15 feet before Mike would take back the school record at Mt Sac with a 15-0¾ vault. Matt finished the year on top with a 15-3 clearance. 2004 started with a bang for Mike as he cleared 15-2 indoors in January. 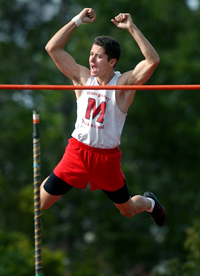 Mike would finish high school with seven jumps at 14-11 or higher. Matt surpassed Loraine’s 14 jumps at 14-8 or better with 17 total of his own and come ever so close to reaching the Empire record with a best jump of 15-7 for 3rd at the Arcadia Invitational. Last year Maria Carrillo’s Cooper Plattus won the NCS MOC at 14-9 to add a mark to the all-time top 50. Only the Tillinghast twins and Loraine have ever jumped higher as juniors.